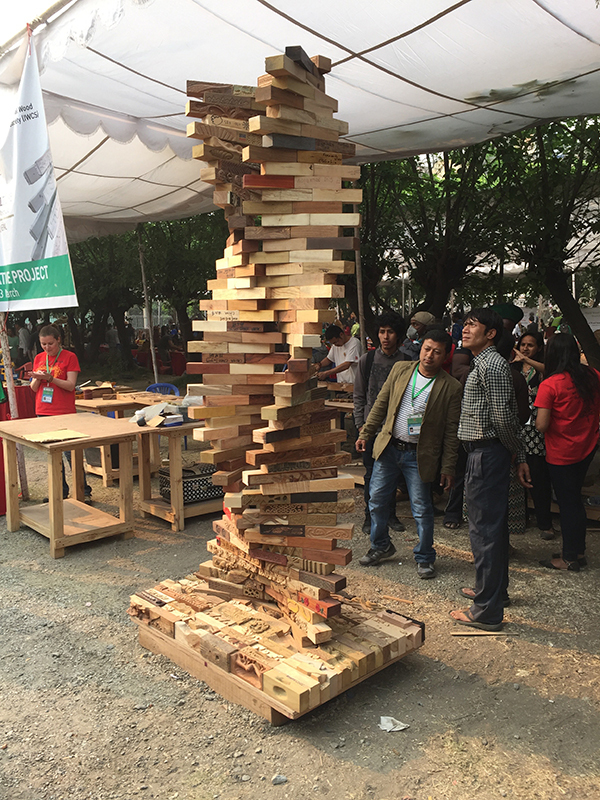 The 67th Session of the United Nations General Assembly (2012-2013) established March 21st as “World Wood Day.” Each year, the occasion has been celebrated by a gathering of woodworkers and artisans from more than a hundred countries. 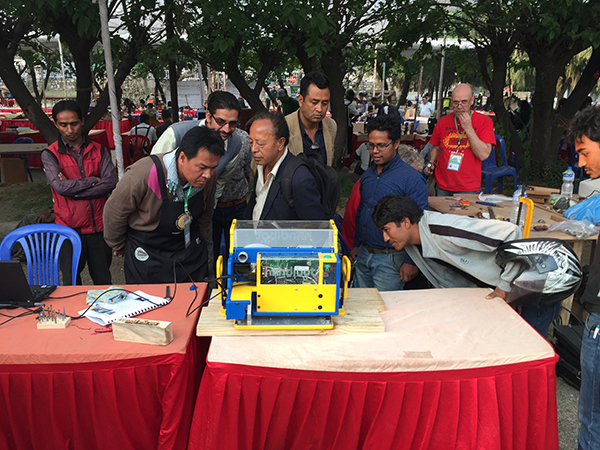 This year’s event was held in Kathmandu, Nepal – the top of the world. 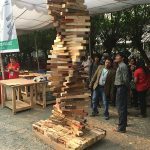 In late 2015, I was invited to be part of the Collaborative Project team for World Wood Day 2016. The team included artisans from sixteen counties; from Australia to Zambia. The team works together to design and construct a single large sculptural project, on-site, during the two weeks before the March 21st event. It’s always a tough challenge – time is short, funding is limited, getting 20 people (with independent artistic visions and strong egos) to work together, language differences all contribute. 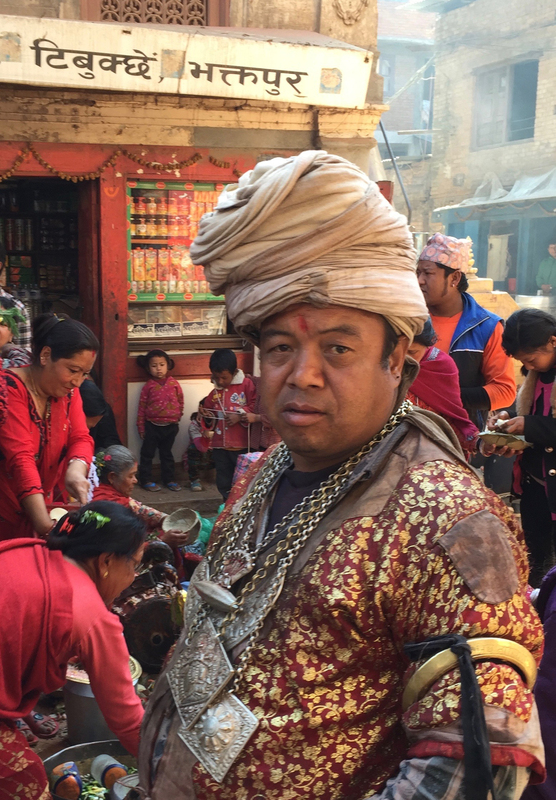 This year there was another level of complexity: in Nepal you can’t drink the water and can’t breathe the air. 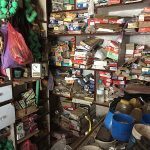 You can’t count on electricity being available nor can you find even the most basic materials supplies. With these challenges in mind, I reached out to the folks at Handibot in January, and was delighted to hear that they would support the effort by providing a Handibot to the project. Work by a Nepali member of our team. 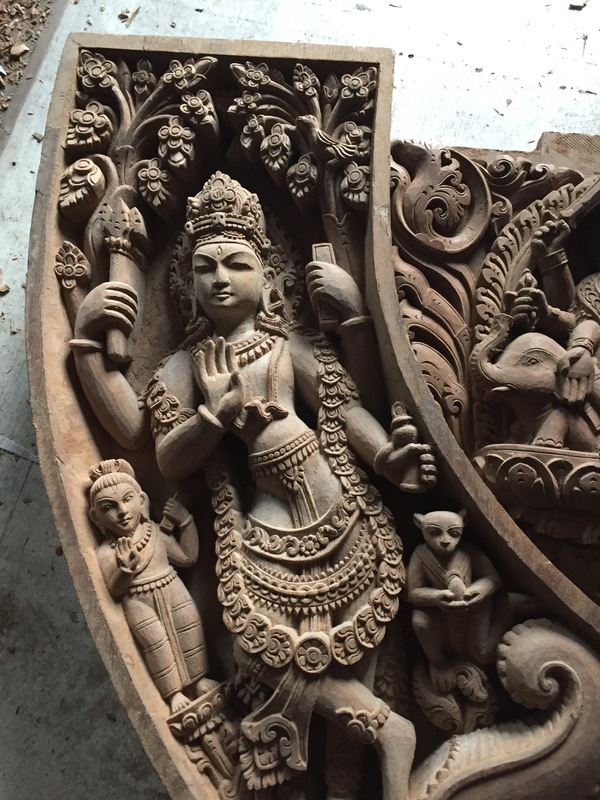 Nepal has a long wood carving tradition. But with a median income around $700 a year and staggering challenges from the 2015 earthquake, Indian boycott, pollution, and resources constraints, it was not clear how automation would be regarded. We faced three distinct challenges. First, I had no experience at all with CNC in general or Handibot in particular. It wasn’t immediately clear what it would take to come up to speed, not only on the Handibot, but also on the CAD software and tool path generation. I knew it would be nearly impossible to get support once I was in Nepal. Second, Nepal is remote. This poses all sorts of challenges. We had no experience getting equipment in or out. Customs can create all sorts of issues. And we had no expectation that we would be able to have Internet access, or be able to get components. We knew we had to bring everything with is. There is no place to buy router bits if you need them. And last but not least, we had to figure out how the Handibot could contribute to the projects themselves. I was delighted to find a makerspace in Cambridge, Massachusetts that has one of the original Handibots. 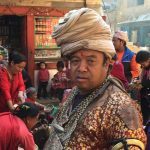 By going there, I would be able to get the knowledge I’d need before I headed for remote Nepal. The good news for me (and for anyone considering getting started with Handibot) was that the learning curve wasn’t tough at all. 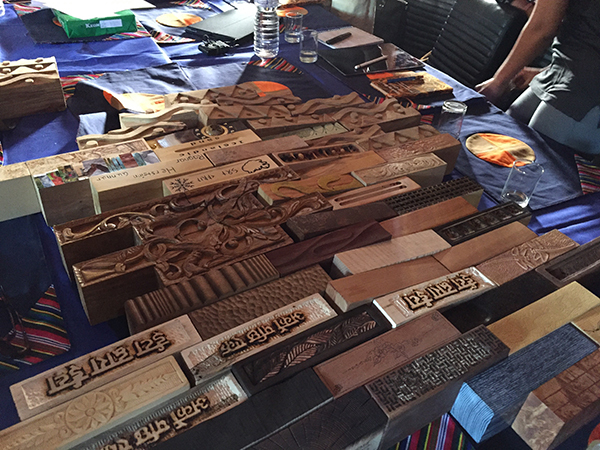 There were plenty of online resources and the VCarve Pro website had great examples. It took less than 20 hours of hands-on effort for me to feel completely comfortable. 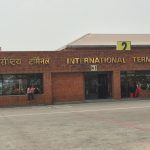 Knowing that it would be very hard to get support once I arrived in Kathmandu, I headed down to Durham, NC to meet Andy Martin and the Handibot team and for some expert advice – a that trip turned out to be extremely helpful. They are a great group and the insights I got, principally around how to create fixtures to hold material, and how to index on larger stock, were excellent. If you are new to Handibot, it’s worth it to take some time to get a demo and a tour at their Durham, NC facility. 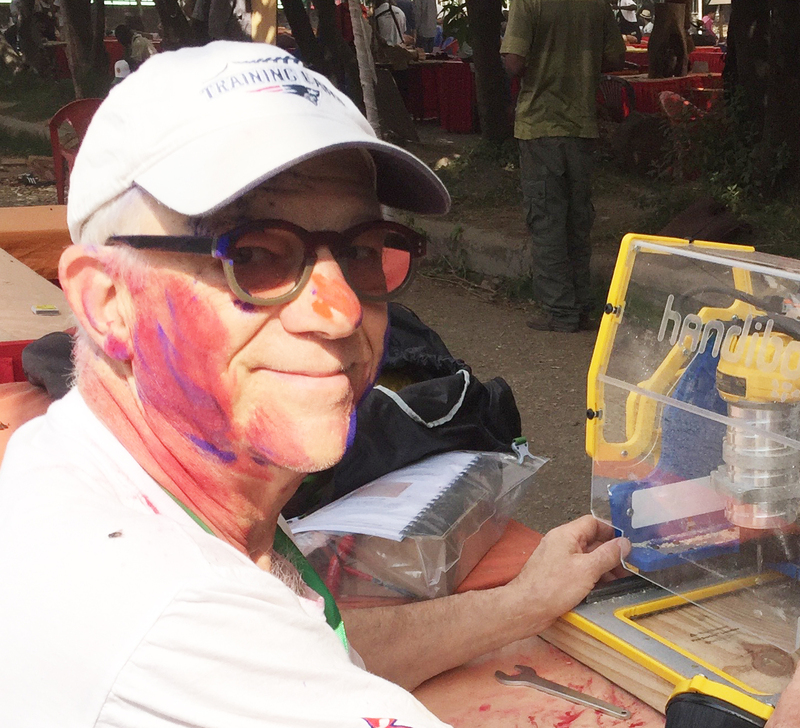 I was ready to run the Handibot, but nothing could have prepared me for what I found in Nepal. A few of us arrived a week early to get things prepared before the entire team gathered. We knew that working in a remote, developing country would present challenges, but we had no idea whatsoever how great they would be. There are the ones I mentioned earlier: you can’t drink the water and you can’t breathe the air. Most of the food is contaminated. No fresh fruit. No salad at lunch. And rituals from sun up to sun down. We expected those. What we weren’t prepared for were the challenges we’d face as woodworkers. Some examples: Power was available twelve hours a day, and the hours changed every day. It might be on from 10AM to noon and then from 6PM to 11PM one day, only in the middle of the night the next day. One small touch of irony. Everyone has a cell phone. The power is sporadic, but there is an app to track its availability (available on both iOS and Android!). 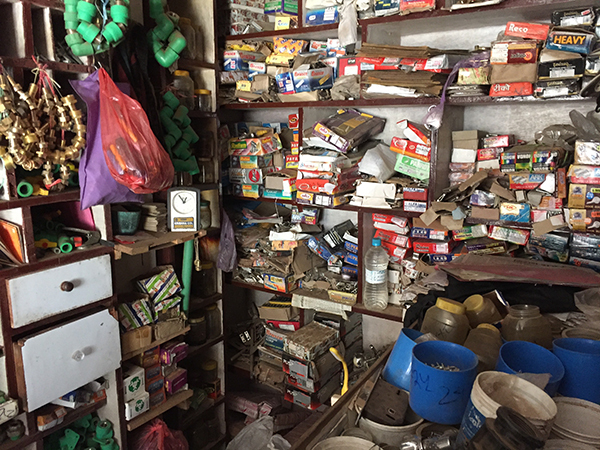 We needed to buy tools in Nepal. Mostly, these were small electric tools; things like electric chainsaws, drills, and circular saws. Not only were they difficult to find, but to say that they were of low quality would be an understatement. 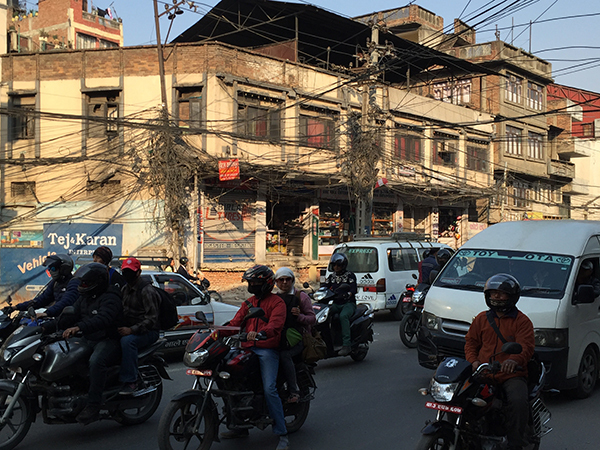 No big box stores in Kathmandu. No shopping online and having Amazon deliver overnight. Google searches don’t produce any useful results. You basically have to go to the street that has shops and start looking. Every day I got on the back of one of our Nepali colleague’s motorcycle and went on a search. Extension cord? No way. Never heard of it. Buy a roll of wire, strip the ends, and stick the bare ends into a 220V outlet. How about some nuts and bolts? No problem, except we couldn’t really find any one “store” that had more that 10 or so of any one size. Eye bolts? No problem — just find someone with some rebar, a forge, and a welder. The challenges, though, didn’t stop the team from doing spectacular work. 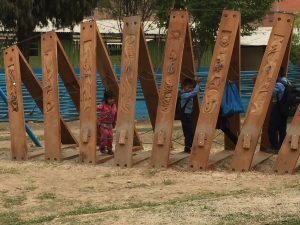 In a bit more than two weeks, we completed a large interactive sculpture that will stay permanently in the school yard where it was built, a second play structure based on the design of Hindu temples, and a third piece that has two spiral, interlaced towers constructed from more than 200 wooden bricks. Some months before the World Wood Day event, a request was sent to accomplished woodcarvers around the world to create individual bricks out of local woods, carved in any way the artist wanted. I had decided that this form would be the best way for me to master the Handibot. The tower includes several bricks that were carved by a Handibot. 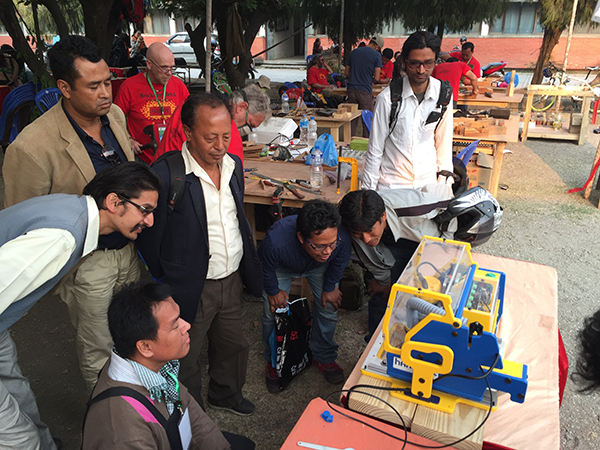 Unfortunately, the complexity of getting the Handibot into Nepal proved to be greater than we’d expected. 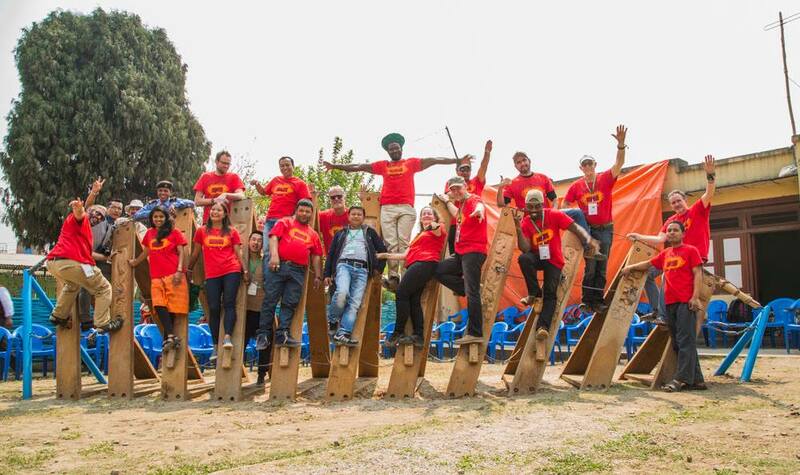 It finally arrived, but only after we’d moved our team from Bhaktapur to Kathmandu, and the bulk of the work was done. No explanation as to why. It’s just really tough to get stuff done in a developing country. The infrastructure just isn’t there. One of our team members needed to change his flight. He went to the airline office and had to wait for three hours for the power to come back on so that they could use a computer. 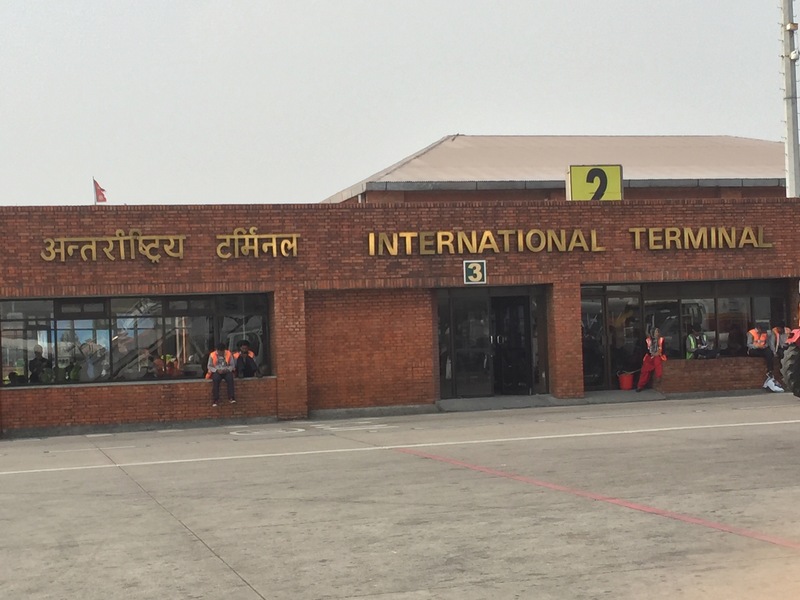 While we weren’t able to do nearly as much as would have been possible had the unit cleared customs a couple of weeks earlier, we did accomplish a couple of important things. The twin brick towers include several bricks carved by the Handibot. They’re the ones with the Nepali text. More significantly, we introduced this next-generation technology to both the accomplished woodworkers on the World Wood Day team and to hundreds of people who were fascinated by the ability of this machine to do amazing things – seemingly on its own.